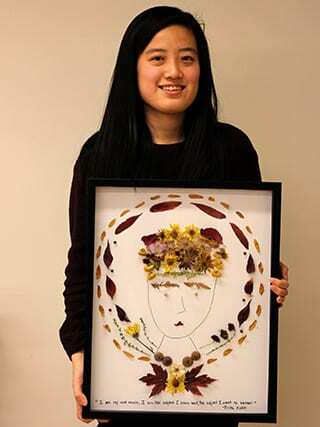 Portrait of Frida Kahlo in locally collected and preserved flora. If you’d like to catch a glimpse of students’ final projects in the Art of Horticulture course, you can sneak a peek online. You can also see previous classes’ work (as well as other class projects and videos) by visiting the Art of Horticulture’s gallery page. Emily Detrick (MPS Horticulture ’16), who is a lecturer in the Horticulture Section and gardener at Cornell Botanic Gardens, teaches the course. She took over this semester from Marcia Eames-Sheavly, who created the course in 2003.